Hazelwood Allied Moving and Storage has been helping families make local, national and international moves since 1918. As a full service moving company specializing in high quality moves, they offer packing services, a Santa Barbara storage facility and moving supplies to help make your move as streamlined as possible. These quality movers have relocated thousands of clients to beautiful Santa Barbara from throughout California and the U.S. After their move, customers of Hazelwood Allied are often interested in finding a creative Santa Barbara interior decorator that can help them turn their new house into a home. In an effort to ensure their customers are well advised throughout the moving process, Hazelwood Allied Moving and Storage reviewed 3 Santa Barbara interior decorators with a unique eye for style and fashion. The final selections were chosen based on experience, education and ability to capture the essence of Santa Barbara’s rich Spanish heritage inside the home. Ann James Interior Design has been creating exceptional homes in the Santa Barbara area for over thirty years. With a portfolio of styles that range from traditional to Spanish, or breezy, modern Californian, Ann and her team bring an extraordinary attention to detail to eachhome they decorate. You will feel comfortable and stylish in your Santa Barbara dream home. Visit their website or call 805-969-4554 for more information. William Laman Furniture is well known in Montecito for furnishing homes with elegant furniture and antiques that accent Santa Barbarahomes with a touch of the local heritage. They have a particular strong suit in the garden and patio department. Try out some new items from William Laman or check out their classic antiques. Look for baskets, vases, and other accessories for just the right finishing touch. Visit their website and Facebook page or call 805-969-2840 for more information. 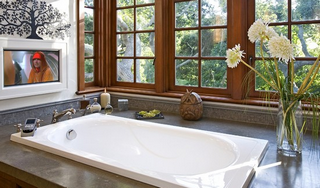 Sandra Canada Design has brought out the best in Santa Barbara homes for many years. Sandra and her experienced team of design professionals get to know you and your personality, and create a tasteful home environment that truly reflects your unique tastes. Clients referred to Sandra always report a happy experience. Call 805-693-9931 for further information. Hazelwood Allied is pleased to recognize these interior design resources in the Santa Barbara community. They are dedicated to providing exceptional service to their clients. Count on Hazelwood Allied and these fine Santa Barbara decorating firms to help you move those precious high price items safely and securely, and position them back into your new home sweet home. About Hazelwood Alled Moving and Storage: Hazelwood Allied Moving and Storage is one of the finest self-storage and moving companies Santa Barbara has to offer. Santa Barbara home owners and businesses turn to this full-service relocation company to handle everything from their family heirlooms to rugged business equipment. Owned by the McCann family for over 41 years, these nationwide movers maintain a commitment to quality and customer service. With this professional moving company on their side,Santa Barbara homeowners can sit back, relax and let Hazelwood Allied carry the load. Visit their website and Facebook page or call800-541-5958 to schedule a complementary move analysis. As an expert in moving homes and storing packages, Santa Barbara Hazelwood Allied is truly adept in knowing the companies that offer quality services in the field of interior design. Due to their distinct style and fashion, three interior decorators are positively recognized and reviewed by Hazelwood Allied. Further, I am truly interested on the possible partnership of Moving companies and Interior decorators in actualizing the dream homes of their customers. To provide optimal service to its customers, Hazelwood Allied recommended premier and stylish Interior Designers in Santa Barbara. Through this way, the public can guarantee that these designers are capable in creating the finest and luxurious ambiance in our homes. Personally, I am quite interested with William Laman Furniture for it provides elegant and historical accents in its creations. It's been our intention for years to proposition consumers that implicit most in pro house decorating. Permit our Santa Barbara house decorating loosen some accentuate you've had contemplating the matter. We provide you a choice of nine Santa Barbara house decorators to correct your home's peek. The moving process is a start of many tasks ahead. This is true as one needs to do the necessary arrangement of one's new home. This is the primary concern of this article as Santa Barbara movers recommends interior designers. By seeking the needed help, people can do the designing as well as organizing of one's new home easier. since 1918, they have performing the wonderful job of helping families to make local, national and international moves . I am talking about the Hazelwood Allied Moving and Storage , probably the best package movers in the city you could ever get. William Laman Furniture stands for quality and design. You are doing an amazin job guys and the furniture is worth every penny.